All (or at least almost all) tournaments at ATP level have a qualifying competition, from which players can get into the main draw. Players qualifying for the main draw through the qualifying competition shall receive qualifying points in addition to any points earned, as per the following table, with the exception of Futures. I am not sure whether I understand this correctly. Is this the number of points that a player who qualified to the main draw receives? (In addition to the points he receives from the competition.) So the players who do not qualify do not receive any points? Yes, players can receive rankings points for winning qualifying round matches. The amount of points they win typically depends on how many matches they win and what level of tournament it is - a 250, 500, 1000 (Masters) or 2000 (grand slam). An easy way to see what kind of points are awarded is to go to a tournament profile page for a tournament on the ATP's website and click on the "Points & Prize Money" tab (it's a little further down on each of the tournament profile pages). 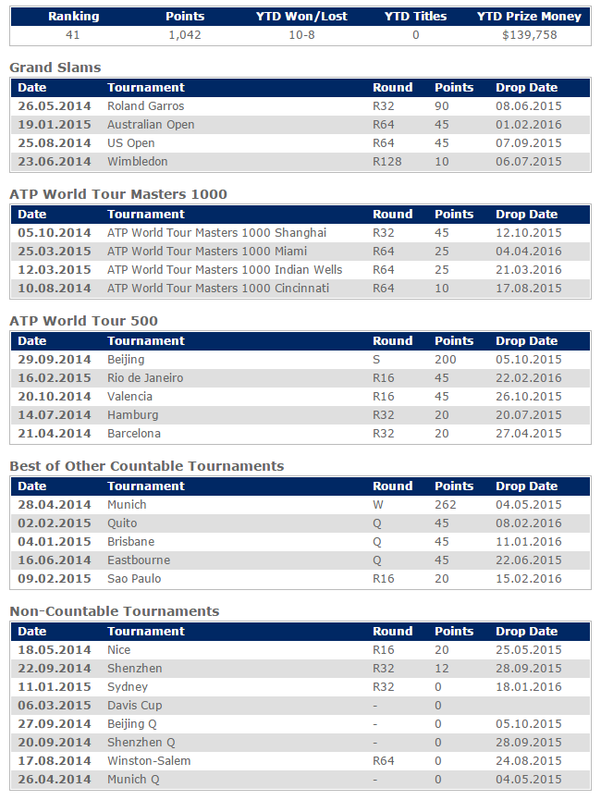 It shows a breakdown of the prize money and points awarded for each level of results (both singles & doubles). Bucharest: 12 points for making it through qualifying and into the main draw, 6 points for making it into the last round of qualifying. Barcelona: 10 points for making it through qualifying and into the main draw, 4 points for making it into the last round of qualifying. I believe the reason for the difference in points has to do with how many rounds of qualifying are actually held - only 2 qualifying rounds were held in Barcelona, while 3 rounds of qualifying were held in Bucharest. I think that it might be useful to illustrate this also with examples. At 2014 BMW Open it was possible to get 250 points for winning the tournament. Winning qualifying meant 12 points. (It is a part of part of the ATP World Tour 250 series.) Martin Kližan won both qualifying and the whole competition. Not the answer you're looking for? Browse other questions tagged tennis ranking atp or ask your own question.